Episodes of electric shocks can come on suddenly, and unfortunately, they remain one of the least-understood symptoms of menopause. Although more research is needed to truly pinpoint the source of these electrical sensations in the head and body, it's important to learn all there is to know about current possible causes so that you can get a treatment plan underway. Some women describe electric shocks as similar to a rubber band snapping between muscles. Other call it a “zap” within the nerves of their head or limbs. Still other report electrical sensations across the skin, such as when a limb goes numb. The immediate trigger for electric shocks is a “misfiring” in the process of brain and nerve cell communication, known as electrical synapse. This process involves passing incredibly rapid electrical signals to the immediately adjacent cell, and is usually responsible for rapid defensive reflexes. If these electric signals go amiss, they can produce these “zapping” sensations in the limbs, although there are different underlying causes for these errors. 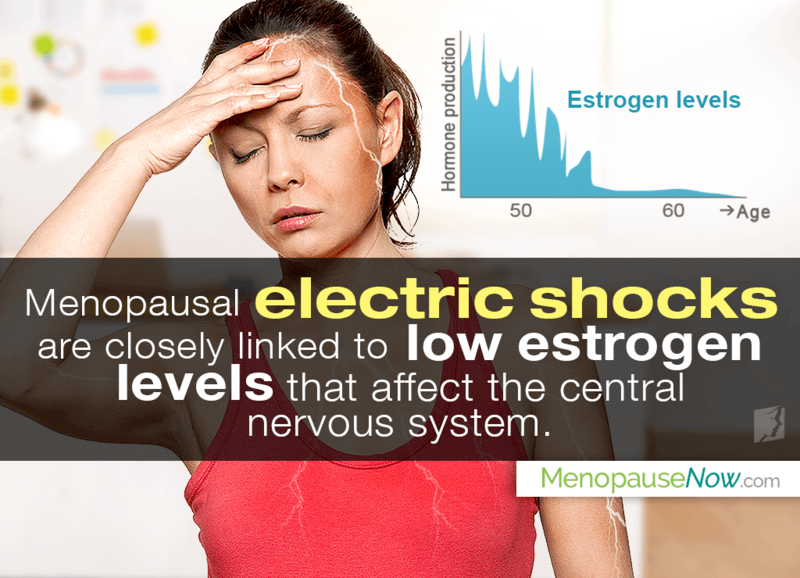 Although researchers don't yet agree completely, most believe that menopausal electric shocks are closely linked to lowered levels of estrogen during this stage of life. Estrogen is known to play an important role not only in the reproductive system, but also in the central nervous system; its decline is thought to increase a woman's propensity to synapse misfiring, and thus to electric shocks. Hot flashes. Though hot flashes are not a direct cause, many women report feelings of electric shock immediately preceding a hot flash, leading experts to believe that a connection between the two is highly likely. Hot flashes also stem from low estrogen levels. Osteoporosis. Women suffering from osteoporosis may be more prone to electric sensations in the body, as the loss in bone density could damage the thousands of nerves within the spine. Relax. High stress levels cause a buildup of cortisol, a neurotransmitter that can increase your chances of electric shocks. Keep cortisol levels low by giving yourself half an hour a day to relax; meditation, breathing exercises, or even reading a book can lower stress levels. Increase your calcium intake.Calcium levels are important for proper synaptic function. Dairy products such as milk and cheese are classic examples, but leafy greens, seafood, and legumes also contain high levels of calcium. Vitamins. A lack of vitamins B12 and E, potassium, magnesium, and omega-3 fatty acids have all been linked to more frequent electric shocks. Lean meats, cold water fish (especially sardines), and olive oil are good sources of these nutrients. Switch prescriptions. If you are experiencing this sensation as a result of prescription drugs, talk to your doctor about reducing dosage or switching medication. Herbal supplements. Some alternative treatments contain plant estrogens to help raise estrogen levels; most notable among these are soy, dong quai, and black cohosh. Understanding the possible causes of electric shocks in the head and body is the first step towards finding relief. If you suffer from this condition, talk to your doctor to find out if electric shocks are a symptom of a larger issue, and together, you can make a plan for managing discomfort that will work for you. Click on the following link to learn more about electric shock treatments. Marchettini, P. Lacerenza, M. ,Mauri, E., Marangoni (C.) (2006) Painful Peripheral Neuropathies. Current Neuropharmacology¸2006 July, 4(3) 175-181. Electric shocks are symptomatic of both pregnancy and menopause. The condition; however, is experienced quite differently between them.